2ND BDE - If the war in Vietnam has proved one thing, it is that the heroism of the American soldier knows no rank. 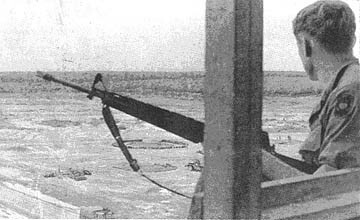 That valor again arose recently when a 25th Inf Div forward base camp at Song Be, Phuoc Long Province, came under heavy communist mortar and recoilless rifle attack. A brigade operations officer ran through a storm of mortar fire to order nearby helicopters airborne. A senior non-commissioned officer dashed from tent to tent to ensure all his men had reached the safety of bunkers. And a wounded enlisted man left his sand-bagged shelter to haul a more seriously wounded buddy to safety, refused medical attention for himself, and took command of an aid station when the medic-in-charge became a casualty. MAJ Victor A. Weber, a native of Victoria, Tex., and air operations officer of the 2nd Bde, was working in the sunken bunker that served for the brigade's forward headquarters when the attack began. The heavy shelling within minutes had cut communication lines to helicopters parked on the nearby Song Be airstrip. Weber immediately dashed 500 meters through the mounting fire to alert them to take off. Once alerted, the helicopters located the enemy mortar positions, brought them under attack and relieved the barrage on the American camp. The officer was credited with initiating at great personal risk one of the camp's chief counter-mortar defenses. SGM Donald Peroddy of Reno, Nev., also had been in the command bunker when the siege began. As he dashed from the bunker to ensure his men had reached safety, the concussion from a nearby round knocked him dazed but unharmed to the ground. Picking himself up, he continued to run from tent to tent when he came upon a seriously wounded soldier. The 2nd Bde sergeant major then carried the man to safety, returned through the area where the majority of the rounds were landing, formed an evacuation team and led them back to the wounded man. Continuing to expose himself to the communist fire, he found another wounded man, picked him up and led his evacuation team back to the forward brigade aid station. When they arrived, Peroddy began to administer first aid to the wounded who had poured into the station but as yet had been untreated. Already bandaging the stream of wounded was SP5 Donald R. Green, a native of Brunswick, Ga., who moments before had committed his own special act of self-sacrifice. Wounded slightly but painfully in the initial stages of the attack, Green noticed a more seriously wounded soldier laying exposed to the incoming rounds. Darting from the bunker in which he had taken refuge, Green lugged the man back to the aid station, only to find the medic wounded and a growing pile-up of untreated casualties. Ignoring his own wounds, he immediately began to give first aid and assist in their evacuation. Only after all others had been treated or evacuated did he himself accept medical treatment. 2ND BDE - Infantry and armor units participating in Operation Atlanta staged a classical combined-arms team assault recently, killing three communist soldiers and uncovering the bodies of 16 more. Upon searching through the overrun communist base camp, they captured two CHICOM carbines and more than 100,000 lbs of rice. The team, hastily thrown together when a company of the 2nd Bde received heavy automatic weapons fire from an Iron Triangle clearing, suffered one American killed and two wounded. The maneuver started when Alpha Co, 2nd Bn, 27th Inf "Wolfhounds," moved into what was to be their new night location. Suddenly they began to receive heavy automatic weapons fire from a series of enemy positions on the opposite side of a small clearing. When they called for reinforcements, a platoon from the 4th Bn (mech), 23rd Inf, and two tanks from the 2nd Bn, 34th Armor, plowed through dense undergrowth to aid them. The mechanized infantry and armor cut through the center of the Wolfhound lines, overrunning the VC positions while Alpha Co provided covering fires. On searching the battlefield, the 2nd Bde troops found two CHICOM carbines and more than 100,000 lbs of rice stored in crude bins scattered throughout the area. In addition to the three communists killed in the assault, they turned up 16 bodies lying in shallow graves, believed to have been killed in various actions two to three days earlier. DAU TIENG - Three men identified by Vietnamese interpreters as Viet Cong medics were detained by 3rd Bde, 25th Inf Div. 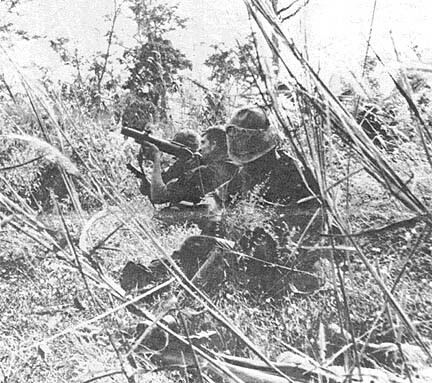 troops in a swift cordon and search of a VC district headquarters south of Dau Tieng. One VC suspect was discovered hastily attempting to hide a store of medicine and some tax records as the 3rd Bn, 22nd Inf "Regulars," closed in on the village of Ben Chua. The other two suspects were flushed from a hidden tunnel after they threw three grenades at the pursuers in an attempt to escape. Only one of the grenades exploded. "We caught four other suspects and many more probably escaped through the tunnels," explained CPT Herbert C. Chancey Jr., battalion S-2 from Augusta, Ga. "This village is the VC recuperation and resupply headquarters for this area." The 36 tons of rice found during the three-day operation verified Chancey's statement. DAU TIENG - Eight VC sampans, three of them equipped with outboard motors, were destroyed recently by elements of the 3rd Bde, 25th Inf Div. While patrolling along a stream near the Saigon River south of Dau Tieng, the 4th platoon of A Co, 3rd Bn, 22nd Inf, discovered the sampans, two of which were in a boathouse repair shop. 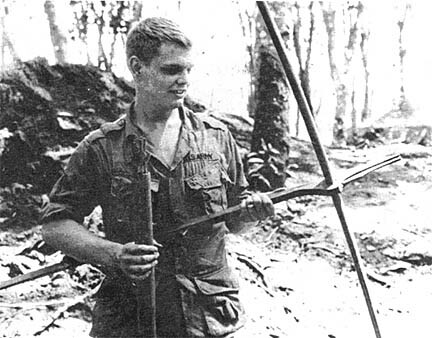 The patrol, led by 2LT John W. Erby from Fresno, Calif., had been searching for any Viet Cong that might be slipping in or out of the nearby village of Ben Chua, which had been surrounded by the unit the day before. "With all of the fresh footprints along the stream bank and the provisions on board, I'd definitely say that the sampans had been used the day before," commented Erby. DIV ARTY - Gunpowder is used to fire artillery projectiles, but there is an unusual projectile in the 25th Div that eats gunpowder. 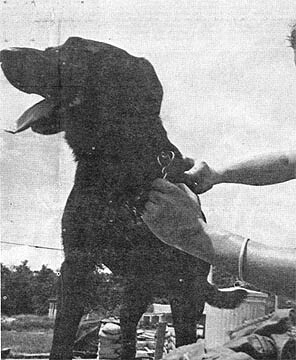 The projectile with the unusual appetite is a two-pound puppy, called Projo (artillery slang for projectile) owned by PFC Robert H. Kelley of the 3rd Bn, 13th Arty's Charlie Btry. Projo is almost ten weeks old but when Kelley bought him from an ARVN soldier he was "just a tiny, floppy-eared, lump." According to Kelley, "You could just about hold him in the palm of your hand. I always wanted a dog and I hope I can take him home with me next spring." Now Projo is a full-fledged cannoneer and has made several road marches with the battery. He rides on the self-propelled howitzer assigned to SSG William Wells. "His favorite spot is on top of the barrel and it's really comical to watch that little mutt with his ears flapping in the wind like a fuzzy pin wheel," chuckled Wells. It was while Kelley was on R&R that the artillerymen of "The Clan" first noticed Projos' strange eating habit. "We had fired during the night using partial powder charges and the extra gunpowder was left in a pile for burning the next morning," related Wells. "When I woke up and looked outside the next morning I couldn't believe my eyes! There was Projo munching away on a powder bag as if it was the natural thing to do." The cannoneers have been trying hard to curb the strange habit of their mascot. "Presently there is a campaign under way to keep him so full that he won't want to eat gunpowder," explained Wells. "Everyone is helping out, even the battery commander. He gave Projo a whole can of his potato chips the other night." "Yeh, but he still manages to get into the stuff," said one of the cannoneers dejectedly. It isn't that the puppy has any ill effect from eating the powder; the artillerymen are just afraid that he might blow up one day. 2ND BDE - A curious tunnel rat pulled the cork recently on an underground Viet Cong crypt directly underneath a 25th Inf Div battalion base camp in the Iron Triangle 39 kms northwest of Saigon. PFC Jerry Hawkins of St. Louis, had come to what appeared to be the end of a VC tunnel near the 1st Bn, 27th Inf's forward base camp. "I was curious about the sudden dead ending," Hawkins later recounted, "so I probed around and discovered a big, cork-shaped plug camouflaged with mud." He finally pulled the tight-fitting stopper from the tunnel wall, scratched out a hole large enough to fit through, and continued to explore the tunnel system. At a point directly beneath the base camp, the passageway opened into a large vault, the walls of which contained fresh graves. The enemy had apparently been killed several days before when air strikes and artillery pounded the area. The tunnel Hawkins explored was part of a massive network of interconnected bunkers, trenches and command posts destroyed during Operation Atlanta. 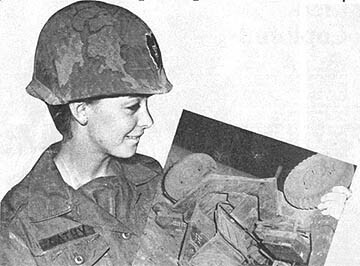 SAIGON (MACV)- "Don't take any wooden nickels" warns against getting stuck with something that has no value. Paper nickels, however, are part of a system that has great value to the individual in Vietnam and American fiscal programs overseas. Military Payment Certificates (MPC) protect our country and host nations in vital economic areas. The use of MPC began in Vietnam on Aug. 31, 1965, and they are also used, in another series, in Japan and South Korea. U.S. dollars are one of the three currencies negotiable on the world market. Therefore, communist nations attempt to acquire all they can for use in international trade. Stopping the flow of U.S. dollars to communist bloc nations is one of the reasons for the MPC program. The "scrip" as MPC are sometimes called, also serves to protect the economy of the host nation. South Vietnam, for instance, needs all of its piasters in circulation to prosecute the war and finance nation building. Converting piasters to dollars and removing them from circulation serves to retard the economic progress of the Vietnamese nation. Two major threats to the MPC system are major counterfeit operations and leakage of large amounts of scrip into the local economy. In order to safeguard against these hazards, series changes are made at irregular intervals on short notice. The end result of these switches is to leave hoarders and counterfeiters with stacks of worthless paper, as useless as Confederate money, after the brief changeover period. The MPC protects you by making it harder for communist countries to get the dollars they need to buy war materials on the international market to use against you. They also help the Vietnamese government keep its currency in circulation so it will be able to stand on its own economic "feet." Don't take any wooden nickels - but take good care of your paper ones! Effective Jan. 1, 1968, all orders involving military personnel will include the Social Security Account Number as an integral part of the Standard Name Line. Effective immediately those orders to be published or issued with an effective date of Jan. 1, 1968, will also contain the Social Security Account Number in the Standard Name Line of the order. Orders already published or issued with the effective date on or after Jan. 1, 1968, will not be amended solely for the purpose of complying with this new procedure. Nameplates worn on the uniform by U.S. Army personnel will now be provided without cost to the individual. DA-Message-838560 announces that nameplates that will be worn when prescribed by the commanding officer are to be made of laminated plastic with a non-gloss black finish. Obsolescent nameplates are authorized until January first 1970. SAIGON (MACV) - Major automobile manufacturers have sales representatives at retail outlet sites of the Vietnam Regional Exchange to assist servicemen in the selection of a new car before they return to the U.S. Currently, four firms are represented. They are General Motors Corp., American Motors Corp., Ford Motors and Chrysler Military Sales. These have representatives at each of the major exchanges in the Saigon area, Cholon, Brinks and Tan Son Nhut. In addition, General Motors Corp. has a representative at Bien Hoa. American Motors Corp. is also represented at DaNang Hill 327, Bien Hoa, Cu Chi, II FFORCEV and Cam Ranh. Ford Motors has placed sales representatives at DaNang Hill 327, Bien Hoa, Nha Trang, Cam Ranh, Di An Support Command, 1st Inf Div, Vung Tau, Cu Chi, An Khe, Pleiku, 4th Inf Div, II FFORCEV and Hq, 3rd Bde, 1st Inf Div. Also, Chrysler Military Sales has representatives at Nha Trang, An Khe, Qui Nhon, Pleiku, Cu Chi, Da Nang, Bien Hoa, II FFORCEV, and Hq, 196th Inf Bde. MONEY seems to be a major concern of everyone. Not only how to make and save money, but more importantly, how to spend it wisely. Government, business, industry, organizations, families and individuals are vitally concerned with getting the most for their dollar. Magazines and newspapers frequently publish articles on "How to Cut Costs" and "How to Get the Most for Your Money,"
The Department of Defense and the various armed services are no different. They, too, want to cut costs and get the most for their dollar, or rather, the taxpayers' dollar. But what does this have to do with you? Why should you worry about government spending? You should be concerned because it's our money that is being spent. More than half of every dollar you pay in taxes is spent on our defense establishment in one way or another. Now, what can you do to help save your money and how much of a difference does it really make? Whether you are in an administrative field, a mechanic, vehicle operator or whatever, you can treat the material, tools and equipment you use as if you were paying for them out of your own pocket. Use them wisely, treat them carefully and eliminate all unnecessary waste. What you help save as an individual may not amount to a great deal, but coupled with the dollars saved by other service personnel, it adds up to millions of dollars each year saved because individuals are cost conscious. No program can be totally successful without the complete cooperation of everyone in the service. In the past five years, the Department of Defense has saved more than $14 billion through the Cost Reduction Program. DAU TIENG - One too many mortar attacks on the Dau Tieng base camp of the 3rd Bde, 25th Inf Div, has resulted in the building of a 68-foot counter-mortar tower on the north perimeter. The 588th Cbt Engrs took four 100-foot telephone poles and put them fifteen feet into the ground for stability; then erected the four story tower in two weeks. Now, six men provide two man shifts around the clock. SP4 James Kahres of New York City and PFC Tom Harmond of Detroit, both from the 2nd Bn (Mech), 22nd Inf, serve the six to ten shifts, morning and night. "We had classes in adjusting artillery fire," said Kahres. "Using-the 68-foot tower, we adjust the M-2 Aiming Circle for azimuth and vertical angle to determine the positions of anything we spot." A direct line to the 2nd Bn, 77th Arty, fire direction control can put fire on target in minutes. So far, the only activity has been the observation of lights moving around over a mile outside the perimeter, and an adjustment of artillery fire for a friendly company that had contact at night. 1ST BDE - Farmers in the isolated village of Thai Hung have been faced with the ever present economic problem of getting their wares to the market. Thai Hung lies in the southern edge of War Zone D, cut off from its district by the wide Dong Nai River, in Bien Hoa Province, just 28 kms northeast of the large markets in Saigon. 1LT Charles Chrosniak, civil affairs officer for the 2nd Bn, 14th Inf, explains the problem. "Until recently, the only way the villagers were able to cross the Dong Nai River was by sampan. Since the district's principal products were rice and lumber - both bulky and heavy - not too much of it got to the markets." Chrosniak was asked by the district chief for help in getting a ferry large enough to handle commercial traffic. "I got in touch with Bravo Co of the 65th Cbt Engr Bn," explains Chrosniak, "and with their helping out with pre-cut lumber and the `Ranch Hand' helicopter unit in Bien Hoa supplying 55-gallon drums, they were able to build a 25 by 12-foot raft." Through the American AID, two 40 hp outboard motors were obtained. "While we were assembling the raft, a hundred or so villagers were hacking away at both banks levelling the grade to the river. They were really enthusiastic," says Chrosniak. 1ST BDE - The dense jungles of the Hobo Woods, 54 kms northwest of Saigon, no longer exist. A 56-day combined land-clearing and search and destroy operation conducted by the 25th Div's 1st Brigade has leveled 90 per cent of the 13,000 acre former Viet Cong sanctuary. Specially equipped helicopters are presently making daily flights over the woods spraying the secondary growth with defoliating chemicals. The mission began Sept. 17 as the monsoon season campaign portion of Operation Barking Sands. Rome plows from the 27th Land Clearing Team, escorted by armored personnel carriers from the 4th Bn, 23rd Inf, and tanks from Alpha Co of the 2nd Bn, 34th Armor, began uprooting trees and dense undergrowth in the northwestern sector of the woods. Leading the plows were infantrymen from the 2nd Bn, 14th Inf. and the 4th Bn, 9th Inf, who hacked their way through the jungle searching out the well-hidden Viet Cong. Fighting from a maze of tunnel and bunker complexes and never attacking in force, 109 of the enemy were nevertheless slain. Working with the infantry were elements of the 65th Cbt Engr Bn, who destroyed with explosives the trenches, bunkers and tunnels that were uncovered. The engineers also upgraded the portion of the main supply route running near the area with tons of laterite and bridge spans. The intensive search turned up some 157,000 rounds of assorted small arms ammunition, 134 individual weapons, 58 tons of rice and eight crew-served weapons. Even a late-model Simca sedan was uncovered, well camouflaged in a field. The 4th Bn, 23rd Inf, also discovered what was described by brigade officers as the Viet Cong propaganda center for the Hau Nghia-Saigon area. The center consisted of two tunnel complexes located in the same general area. From one the "Tomahawks" brought three 35mm cameras and a movie camera; a photo enlarger, photographic chemicals, printing paper and film. From the other came two portable printing presses and 800 pounds of type in both English and Vietnamese. In the last 16 days of the operation, the focus shifted to the Filhol Plantation area. On the north and eastern edges, Rome Plows cleared a strip 500 meters wide between the woodline and the Saigon River, depriving the enemy of concealment. Meanwhile the 4th Bn, 9th Inf, and 2nd Bn, 14th Inf, roamed the area, the "Manchus" killing 10 Viet Cong in their first four days in the Filhol. "We've successfully denied the Hobo to the Viet Cong," summed up COL Edwin H. Marks, brigade commander. "In doing so, we've deprived him of an important sanctuary." 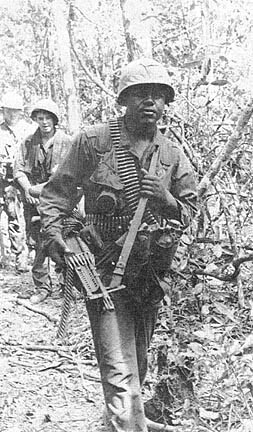 1ST BDE - It was thick jungle ahead, so SP4 Melvin Woods of North Wilksboro, N.C., took the position of point man to demonstrate to the rest of the squad how it was to be done. Woods, from the 25th Div's 2nd Bn, 14th Inf, led off, hacking his way through the thick undergrowth. The squad had gone 35 feet when it happened. As Woods said later, "All of a sudden, I found myself about seven feet off the ground, in a tree, hanging by my right foot." Other members of the squad cut Woods down from his precarious position. He had sprung a Viet Cong foot snare made from barbed wire. "Hurry up you knuckleheads, we've got 12 minutes to get to that chopper." The voice belonged to SSG James Underwood of Gainesville, Ga., the NCOIC of the two Combat Tracker Teams assigned to the 25th Inf Div. "Come on MacFarland. Get that mutt of yours ready," hollered the sergeant as he threw his web gear over his shoulder. PFC David MacFarland, of Watsonville, Calif., snapped a leash on Butch. Mac and Butch have worked together for five months in the jungles and rice paddys of Vietnam. Minutes later the nine men of the team were loading into a chopper and heading for a spot in the HoBo Woods northwest of Saigon. An infantry unit had spotted twelve Viet Cong but had lost the trail. The Labrador Retrievers would now go to work to track the enemy down. Mac and the other handler kept their dogs quiet during the chopper ride. Two men called visuals tried to shout over the "whomp-whomp" of the rotor blades. These men had gone through intensive training to learn tracking skills used by American Indians. The four cover men watched the ground as the chopper dropped to the spot where the trail was supposed to be. These men are the watch dogs of the team. They keep their sharp eyes on the undergrowth and the trees while the rest of the men are involved following the trail. A company commander ran up to the copter as it set down and led them to an open area. Butch was already straining against the canvas harness. He knew it was time to work. "His biggest pleasure in life is to work," said MacFarland. "Swimmin' takes a close second though." The visuals examined the signs. They determined there were between nine and twelve men. There were at least three AK-47s, one carbine, one machinegun and one of the men was wounded. Even though Butch was ready to go on the trail, the other dog in the team took it first. He would work for almost an hour and then Butch would take over. It is rough on both the handlers and the dogs to work point for more than an hour. Nothing except the swishing of the brush could be heard as the team went along the trail. The dogs never make a sound. Once in a while the handler would whisper "sic 'em" to his dog. Underwood thought for a moment and decided this must be the 313th mission by the teams. They had been in country since January. They were the first teams to be employed in the war. Later he would reflect on the grueling day they ran five missions in one day. Suddenly there was split in the trail. The dog became confused and the visuals moved up to examine both trails. One of the enemy had taken off to confuse the dogs. As the team was deciding to stay with the main trail, Mac gave Butch some water. He carries two canteens. One is for the dog. Underwood silently motioned for MacFarland to bring Butch to the point. That did it. The seventy pounds of the five-year-old dog yanked against the track leash. Mac had to hold on hard to keep from being pulled. "When Butch works he likes to go full speed. Sometimes it is tough to hold him back." One visual had his eyes on the ground but his mind was back three months thinking about the trail they followed for slightly more than 35 kms. That was a tough one. Butch had been on the trail almost twenty minutes when he froze. His head went up and his ears stiffened. Everybody stopped and quickly searched the front and the sides with their eyes. The dogs alert anywhere from 100 to 300 meters from the enemy. Carbine and light machine gun fire suddenly shattered the quiet and everyone hit the ground. The dogs have been trained to hit the deck just like the men. They don't bark or run. The reinforced infantry platoon that was right behind the team moved up shooting. The mission for the men and dogs was over. Back in the Cu Chi base camp, Mac let Butch go for a swim in a deep mud puddle and then cleaned him up. A nearby artillery battery fired a volley and Butch started whining. 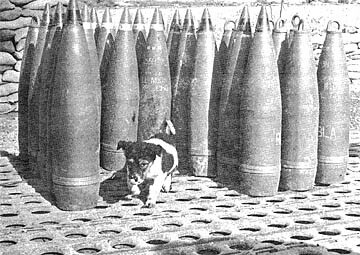 A week earlier an antitank mine blew up and threw Butch almost 15 feet. Explosions have bothered him since then. At the same time Mac had picked up 23 pieces of shrapnel in the arm and flak jacket. When Mac rotates a new man will be broken in as handler. Mac won't have a thing to do with Butch for two weeks. It is a visible strain on the dog to suddenly be deserted by a man who he has worked, slept, eaten and been under fire with. "The break won't be easy," said Mac. "He can be wild, but he is a damn good dog." THE COMBAT TRACKER TEAM MOVES FROM THE LZ TOWARD BUSHES WHERE INFANTRYMEN LOST TRAIL. 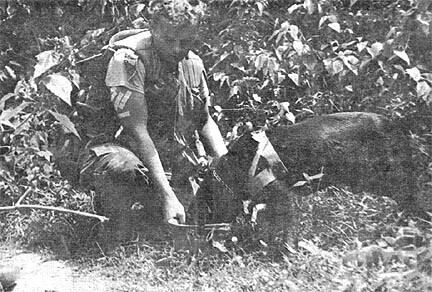 PFC MACFARLAND FILLS HIS STEEL POT FOR THE THIRSTY DOG. BANDAGES ON RIGHT ARM COVER SHRAPNEL WOUNDS. MACFARLAND CLEANS BUTCH UP AFTER RETURNING TO THE BASE CAMP. THIS IS WHAT BUTCH LOOKS LIKE TO VC. 2ND BDE - "When I first saw the school I thought it was deserted," was how 1LT Stanley McKee describes his first visit to the Hau Nghia Province village of Thai My. The visit by this civil affairs officer from the 1st Bn, 5th Inf, started a chain of events that led to the complete refurnishing of the 400-student school. According to McKee the need for restoration was obvious. "The walls were full of holes, the woodwork was rotting and livestock were grazing in the school yard." After talking to the schoolmaster, McKee agreed to furnish the needed material for the project. McKee, who witnessed part of the work, says, "After the material arrived, the villagers turned out in force. While the men worked, their wives cooked meals." After the interior was repaired and painted, the villagers started on exterior improvements. Says McKee, "The paint worked like magic. The villagers built a fence around the school yard, replaced the doors and even hung maps and pictures in the classroom." At the official opening of the school, LTC Fremont Hodson Jr., battalion commander, presented the schoolmaster with world globes - one for each classroom. DIV ARTY - When the new elementary school opens at An Hoa, its pupils will join the growing list of Vietnamese who have benefited from the self-help program of the Civil Affairs Section of the 25th Inf Div Arty. The sturdy benches, desks and cabinets to be used in the one-room school are being constructed by the villagers from ammunition boxes provided by Div Arty. An Hoa's need for furniture for its new school was brought to the attention of CPT Alton D. Morris, civil affairs officer for Div Arty, during a visit to the hamlet which lies some 3 kms west of Trang Bang. "Hamlet Chief Nguyen Van Thieu asked me if I could provide desks and chairs for a much-needed school," Morris relates. "I told him although I could not provide furniture, I would supply the material if he could provide the labor. DAU TIENG - "The growth would definitely have been fatal if we hadn't operated on the man," commented Dr. (CPT) Ira P. Mersack, surgeon for the 3rd Bn, 22nd Inf. The elderly man, one of the over 400 patients treated during a recent two-day MEDCAP by the 3rd Bde, 25th Div, unit near Quan Loi, was discovered to have a malignant cancer growth that required immediate attention. Mersack, a native of Louisville, Ky., called in a helicopter and the patient was flown to a nearby hospital for the operation. DAU TIENG - "Put your arm across his chest, not around his neck," implored CPT Samuel Phillips Jr. as the prospective lifeguard for the 3rd Bde, 25th Div, swimming pool attempted the simulated rescue. "You want to save him, not strangle him." The American Red Cross-approved senior life-saving course conducted by Phillips, a doctor with B Co, 25th Med Bn, spanned 15 days with two hours of hard swimming each day. All the principles used in saving a man from drowning were covered in the course which requires strong swimming, quick thinking, and superior reactions. Five men completed the course and were awarded the Senior Life Saving certificate by Al Beardsley, the ARC Field Director for the 3rd Bde. The men were SP4 Walter W. Hersey, SP4 Patrick Cichon, PFC Lawrence Larbalestrier, SP4 Michael Doolittle, and SP4 Burt C. Hale. "This is what happened because the driver was going too fast. He might as well have hit one of Charlie's mines for the damage it did. The driver ended up in the hospital, and believe me, he didn't get a Purple Heart. I've got the solution for this sort of thing and it's a good solution even though it comes from a `woman driver' . . . drive defensively. That means watch your speed, don't tailgate and watch the other fellow. DAU TIENG - SSG David (Happy) Craddock is one of the most appreciated men in the 2nd Bn, 77th Arty, 3rd Bde, 25th Inf Div. 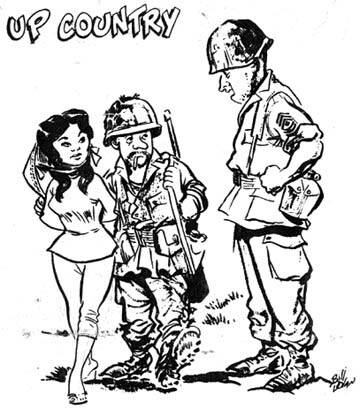 "Happy" is the Hqs Btry Enlisted Men's Club manager and is not only responsible for the club but is obligated to provide the men in the field with cold liquid refreshment. After being appointed club manager in July, Happy began restoration of the club building. The inside was completely renovated: raising the floor, moving the bar, building a new cooler area, painting, new snacks, and over $950 worth of furniture were all part of the 'new' club. Free nights were also added and still sales soared. "It is necessary to frequent the PX daily for resupply," Happy explained, "because convoys don't always get here on time and if we weren't stocked in preparation we would have to close up shop." In the future, he commented, the battery is planning to build a new club triple in size of the present one, complete with a TV room, a reading room, a game room, and of course the bar. 2ND BDE - Captured intelligence reports indicate that Viet Cong in Hau Nghia Province have been pressured to the point of desperation by lack of rice. Men of the 2nd Bn, 27th Inf "Wolfhounds," are beginning to believe it. On a recent search and destroy operation the infantrymen poked a stick into a large manure pile and were surprised to strike something hard. Underneath, they found a ton of hidden rice, a set of one hundred dishes and 18 sets of black pajamas. DAU TIENG - CPT William S. Moats, 3rd Bde, 25th Div. surgeon received a football recently in the mail. It was no ordinary football - inscribed across it was a score - Revere 24, Highland 14. Before coming to Vietnam, "Doc" Moats was the team physician for the Revere High School football team in his hometown of Bath-Richfield, Ohio. The opening game of the season was against Highland, an old rival and considered a power in the neighboring league. Before the game, Coach Fred Ost of Revere told his boys to go out and win this one for the "Doc" - and win they did. A former quarterback with Revere before graduating in 1954, Moats went on to receive his bachelor's degree from Wooster College in Wooster, Ohio, and completed his medical training at Ohio State University in Columbus. DAU TIENG - Firing a grease gun down through the branches at a fleeing Viet Cong, the 2nd Bn (mech), 22nd Inf commander, LTC A. G. Norris of Lagrange, Ga., captured an enemy supply clerk while flying a routine recon mission in his CH-23 Observation Helicopter. The "Triple Deuces" were sweeping the Michelin Rubber Plantation near Dau Tieng when Norris and CPT Samuel R. Noto, the 3rd Bde., 25th Inf Div artillery liaison officer, spotted two men riding a bicycle through the plantation. When pilot WO1 Patrick Bilyk of Pittsburgh, Pa., was ordered to sweep low over the road one of the men broke and ran. The man ran from thicket to thicket in an attempt to get away, but each time a burst of fire from the trailing helicopter moved him closer to the clearing. When they reached the clearing the chopper landed and Norris secured the 100 pound prisoner and put him on his lap for the ride back to base camp. The PW had 10,000 piasters on him and had been instructed to buy dried fish for the Phu Loi Battalion. Following their CO's lead, the next day Charlie Co apprehended three enemy personnel who were transporting rice back to the same enemy group. Somewhere there's a battalion of hungry Viet Cong that plan to stay out of the way of the Triple Deuces in the future. 2ND BDE - It was not exactly grabbing a bull by the horns, but 25th Inf Div soldiers did push a calf by its belly recently to rescue it from a farmer's well. The 2nd Bde's 1st Bn (mech), 5th Inf, was conducting a search and destroy operation near Thai My, a one time haven for Viet Cong in Hau Nghia Province. As the Bravo Co headquarters element broke through a hedgerow, the company commander, CPT Lance Warner of Sandusky, Ohio, noticed an old man digging beside the well. Moving forward to investigate, the officer peered over the rim and saw a calf on the bottom of the well. Realizing the elderly farmer's efforts to angle a tunnel down to the calf would take too long, Warner tried to drop a rope around the animal. When that failed, he removed his web gear and lowered himself into the well to tie the rope around the calf. "With my men pulling and me pushing," he said, "we managed to get the calf high enough to where it could get its legs over the edge." The calf then pulled itself out, the farmer thanked the soldiers, and they continued their mission. 2ND BDE - It was a brief but bloody battle for a group of 25th Inf Div soldiers, resulting in one enemy body count. One soldier commented later that "it would have been a lot sooner, but the VC was chicken." Mechanized troops of the 1st Bn (mech), 5th Inf, were conducting search and destroy operations northwest of here with a Viet Cong rallier who was pointing out secret holes and bunkers. After leading the soldiers to a tunnel, the rallier started to climb inside to check for weapons. "He was back out in a split second," said SP4 Clinton Johnson, an intelligence specialist from Lubbock, Tex. "He explained through the interpreter that he heard noises and was sure there were VC inside." As a final resort the infantrymen threw grenades into the hole. When the smoke cleared a tunnel rat entered the hole. Severals minutes later he came out, with a meek look on his face and a dead chicken in his hand. 1ST BDE - LTC Alfred Bracy has succeeded LTC James Von K. Ladd as commander of the 25th Div's 2nd Bn, 14th Inf. Ladd has been assigned as liaison officer with Thailand's "Queen's Cobra" Regiment. This is Bracy's second tour in Vietnam. He was previously assigned as chief instructor of Infantry at the Quartermaster School, Ft. Lee, Va.
Bracy entered the Army in 1946 as an enlisted man and served with the 11th Airborne Div until 1948. He is a 1952 graduate of the United States Military Academy at West Point. He served as a platoon leader and company commander with the 26th Inf Regt in Europe and Fort Riley, Kan. Bracy was graduated from the Command and General Staff College in 1964. Mrs. Bracy and their three children live in Petersburg, Va.
2ND BDE - Who said television these days isn't realistic? One 25th Inf Div soldier would disagree - after he sat through the opening rounds of a mortar attack and thought it was the television show he was watching. SP4 Richard Speitel of Indianapolis had just settled down in front of the TV set at a neighboring signal unit when a "riproaring combat movie came on," he said. About the same time, Viet Cong guerrillas opened fire on the division base camp with mortars and recoilless rifles. Speitel, a member of the 1st Bn, 27th Inf "Wolfhound's" headquarters company, just sat and watched. "The explosions were sounding off in a big action scene," he explained. "Suddenly I realized we weren't just hearing explosions from the screen. Mortars were landing all around us." Grabbing his hat and heading out the door, Speitel raced through a hail of fire in the battalion motor pool and dove into his bunker. "After it was all over, we went back in the barracks. When I took off my hat, I almost died -there was a hole right through the brim. "I kept thinking how close it passed to my head," the 2nd Bde soldier said. "Whew!" DAU TIENG - A bull session held by a trio of Viet Cong on a trail northeast of Dau Tieng, cost one of the "Big Mouth VC" his life and his rifle recently. A patrol of men from the 2nd Bn, 12th Inf, encountered the noisy "Charlies" while sweeping the jungle during the 25th Div's Operation Diamondhead. Heading for its ambush site, the patrol led by SSG Donald Kord of Indianapolis, came across some bunkers which looked as if they had been used recently. "I wasn't sure if Charlie was still in the area," related Kord, "so two of my men and I moved ahead of the patrol to check. "As we moved up, I heard a voice in front of me, and as I came around a stand of bamboo, there stood a Charlie with his mouth wide open," said Kord. "I triggered a burst and he fell right where he stood, but before I had a chance to fire the other two VC had made tracks." After reconing the area by fire, the patrol moved forward and retrieved the body along with an AK-47 assault rifle. 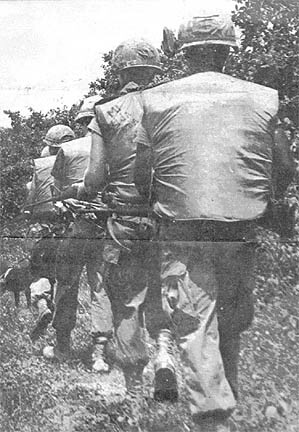 2ND BDE - U.S. and South Vietnamese infantrymen carried the war right to the enemy's bedroom recently in a pre-dawn raid that netted two Viet Cong and three weapons. The raid was staged by members of the Combined Reconnaissance and Intelligence Platoon (CRIP), a team formed by the 25th Inf Div's 2nd Bn, 27th Inf "Wolfhounds," reconnaissance platoon and the Vietnamese Bao Trai intelligence platoon. Moving early one morning through a reportedly Viet Cong infested village in Hau Nghia province, the CRIP elements came upon two guerrillas slumbering peacefully by their weapons. Upon their rather rude awakening, one man quickly surrendered, but the other managed to grab his rifle and make a run for it - straight through the grass wall of the house. CRIP members deployed around the house killed him as he attempted to escape. Captured in the encounter were two carbines and an M-1 rifle. The 208 page color and black and white yearbook is the story of the 25th Infantry Division from October 1966 to October 1967. It follows the Tropic Lightning Division operations through the Boi Loi and Ho Bo Woods, the Michelin and Filhol Plantations and the many nameless but not forgotten swamps and rice paddies. Price per copy is $4.00. This includes prepaid delivery to each subscriber WITHIN the United States. Delivery will ONLY be made in the United States. Payment may be made by American cash, check or money order. Stamps, piasters, or MPC will not be accepted. ROAD NETWORK OPENS - A villager of Loc Thanh (left photo) cuts ribbon which opens road to Trang Bang through Boa Tri to Duc Hoa that was rebuilt by the 25th Div's 2nd Bde and 65th Cbt Engr Bn. Looking on are LG Kahang, III Corps commander, and MG George S. Eckhardt, deputy II Field Force commander. In a brief pageant (center photo) Hoi Chanhs rush to two piles of dirt to remove Viet Cong flags signifying the ousting of enemy forces in Hau Nghia Province. COL Edwin Emerson (right photo), 2nd Bde commander, receives the Vietnamese Cross of Gallantry from LG Kahang for the work done by the brigade. 2ND BDE - The warning on the package may say "Cigarette smoking may be harmful to your health," but a 25th Inf Div sergeant thinks cigarettes and lighters are nothing but life savers. SGT Charles D. Hathorn of Snead, Ala., has good reason to feel that way, after his cigarette lighter stopped a piece of shrapnel heading straight for his heart. A member of Charlie Co, 1st Bn,.27th Inf "Wolfhounds," Hathorn had moved with the company into a blocking force against VC being pushed their way by the rest of the battalion. About 5 p.m., a firefight erupted as the fleeing communists crashed head-on with the American forces. Hathorn and several of his men took refuge in a bomb crater. As the 2nd Bde soldier rolled over to reach for more ammunition, a rifle grenade burst only meters away. "It was so close, I checked myself to see if I'd been hit," Hathorn recalled, "but I kept firing when I didn't feel any pain and see any blood." The fighting ended shortly before dark and the company moved back to its night positions. Hathorn had no chance to smoke. "But I did the next morning, and was I shocked when I looked at the lighter," he said. A piece of shrapnel had ripped through one side and bulged out the other. "I have to load it with fluid through the side where the hole is," he added. "In any case," he said, "it makes me kind of glad I took up smoking." New Wash And Wear Khakis To Be Next Army Uniform? WASHINGTON - A new wash and wear khaki shirt and trousers for both officers and enlisted men is in the mill. The Army staff has approved a recommendation from the Army Uniform Board that the service adopt a durable press, known commercially as permanent press, shirt and trousers combination of polyester-rayon fabric. The new clothing is expected to be an optional purchase item. It is expected to replace the current tan trousers and shirt and be a "middle ground" uniform between Army Green and khaki. It is of the same general type as the tropical worsted shirt and trousers. No definite price tag has been placed on the new uniform but officials expect the cost will be around $10.00. That will be more than the cost of ordinary khaki but less than the cost of tropical worsteds.